The Perception of Scientists – Politics, Perception, Philosophy. And Physics. Ask a primary school age child to draw you a picture of a scientist, and most of us know exactly what they will draw. Inevitably, they will sketch out a white, middle aged man with unkept hair, in a white lab coat and glasses. This impression is one that many scientists have tried to dispel, using a variety of mediums and concepts. In Isabel Clarke’s blog post ‘Have social media improved the perception of science?’, she argues that by making science more accessible, by simplifying world-leading research articles, the barrier between scientists and the general population can be destroyed. There are many people and organisations attempting to do just that, and Isabel points to the likes of Henry Reich, creator of MinutePhysics (YouTube Subscribers – 2.58million) and Elise Andrew, mastermind of the IFLS site (Facebook followers – 18.5million). Science corporations have also caught the social media hype, with the likes of NASA, CERN and New Scientist all running official twitter accounts, with the number of followers in the millions. But are the new ways of presenting ground-breaking scientific discoveries really doing the scientists justice, and are people’s perceptions of scientists really being challenged? Historically scientists have kept themselves to themselves, creating a perceived blockade between themselves and the general public. A perfect illustration of this is the literature which is published by research groups. The language used is incredibly technical, and in some cases obstructive. Now, I recognise that science is not trivial. Not all theories can be simplified so that the general public can understand it, and in fact I think that the continued popularisation of science is damaging the image of scientists, by making the work done seem almost childlike. However, when fellow researchers also struggle to understand the language used in papers, then there must be an issue. I am in no way placing all the blame on the individual authors. As Jeremy Miles articulately writes in his blog, the target audience of scientific papers is not the general public. It is not even, he argues, aimed at researchers in the field. The real target audience is the peer reviewers of the journal, for if you do not please them, your work will not get published. Consequently, in the publish-or-die world of modern science, the only real option is to please the journals referees. That is, however, an issue for a whole new article! This hindrance has created a whole new area of science, science communicators. Examine some of the many fantastic YouTube science channels, and you will likely be fascinated by the diversity of science topics, as well as the filmmaking ability of what is, in the most part, amateur productions. Brady Haran is responsible for a variety of fantastic channels, based here in Nottingham, which covers a wide range of science topics. To name just a few: Numberphile concentrates on explaining mathematical concepts, Sixty Symbols on ideas in Physics and Periodic Videos, which has made a short video on every element in the periodic table. The language used in the videos is non-technical and accessible. The concepts are explained using helpful analogies and the amount of mathematics, equations and graphs presented are kept to an absolute minimum. Does it work? I would argue yes, especially after reading this recent blog post from Brady (a really reassuring read!). However, if I refer back to my five year old’s typical drawing of a scientist I find that, in the case of the Sixty Symbols contributors, the illustration is almost entirely accurate. Of the 17 physicists appearing regularly in the videos, 17 of them are white, 15 are male and most would fit the public’s perception of a typical physicist. Now of course, all the Sixty Symbol scientists are part of the University of Nottingham physics department, and it has long been recognised that there is an issue promoting science careers to young girls in school, so maybe we shouldn’t be surprised at the gender inequality. However, other examples of science communicators outside the world of the internet seem to confirm the stereotype. Carl Sagan, Sean Carrol, Brian Cox, Bill Nye, Matt Taylor (of recent shirtgate “fame”), even Richard Dawkins all also fit. There are, of course, important exceptions to the rule, and it would be remiss of me not mention them. Neil deGrass Tyson has done wonders to encourage ethnic minorities in America, and around the world, to consider physics as a career choice. But I think it is fair to say that the people we have chosen to represent the work that scientists undertake is not diverse enough. The names above show a perfect example of the obstacle young viewers must ignore. Female secondary school students watching the Sixty Symbols channel see video after video of male physics educators, and must at some level seem disheartened at the lack of female participation in the productions. There is not a simple solution to this conundrum. I think modern science communicators do a fantastic job at making science more interesting and accessible. But they fall down in encouraging a wide diversity of students to chase jobs in STEM fields, not through what they are saying, but purely through the lack of diversity of the people presenting the compelling arguments. In my opinion, we need to see more women, ethnic minorities and even non-scientists showcasing the most amazing discoveries to the public, and only then will we make science truly accessible. Perhaps then scientists’ views will become more respected, and their findings carry more weight on issues such as climate change, anti-vaccine campaigns and evolution. In the end, that can only be a good thing for society. ← SHOULD SCIENCE BE CROWD FUNDED? 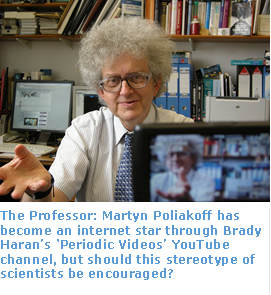 There’s much to agree with in this piece, but I can’t accept the labelling of, e.g., Martyn Poliakoff as a “Stereotype”. Accepting diversity means encouraging everyone to contribute in a way that reflects the person that they are, regardless of their gender, race, age or hairstyle. So let’s keep it positive. Now. Why aren’t there more science communicators with beards?